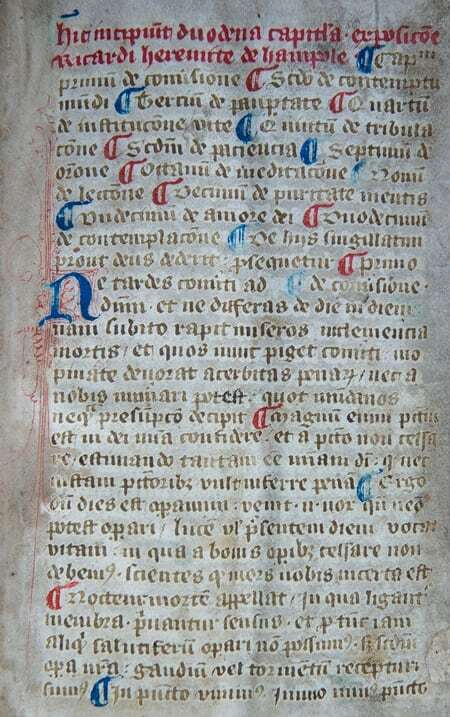 Housed in the Chapter Library at Windsor is a fifteenth century manuscript copy of Emendatio vitae [The amending of life], a spiritual guide written by early fourteenth century author, Richard Rolle of Hampole. The volume containing this title [SGC LIB MS.1]* also includes copies of other works, some thought to be by Richard Rolle, and some by other religious authors, such as Thomas of Hales’ Life of the Virgin Mary, Richard Maidstone’s English translation of the Penitential Psalms and a translation of part of Mediationes vitae Christi [Meditations on the life of Christ] by pseudo-Bonaventura. Before the invention and widespread use of the printing press, the copying of works in manuscript was the sole means for dissemination of the written word. Compilation volumes of earlier works must have been relatively common. Richard Rolle was a hermit and prolific religious author who died at Hampole, South Yorkshire, in 1349. The date of his birth is not recorded, but recent scholars believe that he was born in about 1300 in Thornton, Yorkshire. After attending Oxford University under the aegis of Thomas de Neville, Archdeacon of Durham, he decided to devote himself to a life of contemplation; not within the community of a monastery, but living the solitary life of a hermit. After several years of wandering from place to place within England, and studying briefly at the Sorbonne in Paris, he settled at Hampole. He was to remain there, living in a cell near the Cistercian nunnery, Hampole Priory, until his death in 1349. Rolle’s religious writings, including Emendatio vitae and his English translation of the Psalms, were very popular in the Middle Ages and many manuscript copies were commissioned and made in the fourteenth and fifteenth centuries. The works were to receive even greater circulation in printed form, the famous printer Wynkyn de Worde publishing at least two of them – Contemplacyons of the drede and love of God and Remedy against Temptacyons – in 1506. So influential was his work, that the Lollards, a radical reforming religious group, altered or added passages to a number of his writings in order to promote their cause. To counteract this skullduggery, the nuns at Hampole kept a set of genuine works at the Priory with which later copies could be compared. Emendatio vitae, which was written about in 1340, is amongst Rolle’s most frequently copied works, with over ninety Latin texts still surviving today, in addition to several Middle English translations and modern English versions. Although apparently composed to encourage readers to enter a deeply spiritual and contemplative life, such as that led by Rolle himself, its popularity suggests that it also appealed to a wider audience of men and women who wished to achieve a greater spirituality in their ordinary lives. The book commences with a section on conversion to the Christian faith and takes the reader on a journey of spiritual growth towards the peak of self-abandonment in the pursuit of Christ’s presence: ‘Love reaches the solitary degree only when it excludes all comfort but which is in Jesus and when nothing but Jesus can suffice. The soul has achieved this degree when it loves Him alone.’** However, despite his emphasis on renouncing the pleasures and comforts of the world, Rolle’s spirituality and singular devotion to Christ promises joy and ultimate fulfilment. It is this message that must have appealed to his many readers. These included John Holme, Rector of Brereton in Cheshire, William Holme, John Shelmerdine and Isaac Ogden who, accordingly to manuscript annotations, successively owned this manuscript copy in the seventeenth century. * SGC LIB MS.1 was previously numbered E.I.I.